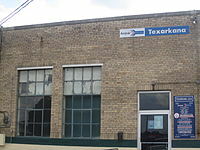 ^ City of Texarkana 2009 CAFR Archived 2011年7月18日, at the Wayback Machine.. Retrieved 2010-11-15. ^ City of Texarkana Contact Directory Archived 2013年11月3日, at the Wayback Machine.. Retrieved 2010-11-15. ^ "Parole Division Region I Archived 2011年9月28日, at the Wayback Machine.." Texas Department of Criminal Justice. Retrieved on May 15, 2010. ^ "FCI Texarkana Contact Information." Federal Bureau of Prisons. Retrieved on June 2, 2010. 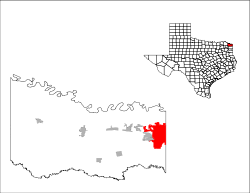 ^ "Ward Map Archived 2011年1月27日, at the Wayback Machine.." City of Texarkana, Texas. Retrieved on July 2, 2010.